Q Acoustics 2000 Series review | What Hi-Fi? A first look at a new product from Q Acoustics has become one of the more eagerly awaited events in our schedule. 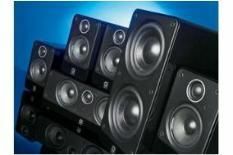 Since its explosive entrance into the AV industry with the 1000 Series loudspeakers, the company has successfully managed to combine production of traditional loudspeakers with the release of some of the most forward-thinking products in existence. The Q Acoustics 2000 Cinema Pack, to give it its full name, replaces the Award-winning 1010i 5.1. It consists of four Q2010 satellites, a Q2000C centre channel, and a 2070S subwoofer. The system costs £550 in the traditional graphite black finish, or £650 should you prefer the piano gloss look, which is available in black or white. First impressions are excellent: they feel solidly built and the gloss finish of our review sample is very smart indeed. Recessed speaker terminals complete the neat appearance. The rear-ported speakers use the same 25mm tweeter with a 'micro polyester weave dome', alongside a 10cm mid/bass driver engineered from a paper/micra mix. As for the sub, it includes twin 17cm bespoke drive units and two mono power amplifiers, capable of outputting 140W. Of course, it's performance that really matters, and these speakers produce an utterly absorbing, detailed and cohesive sound. The Dead Snow Blu-ray affords ample opportunity for the 2000 Series to relay tense atmospherics, and it does so with aplomb. It imparts every intricate subtlety, while providing impressive punch and power. The front three prove impenetrably seamless, with the effects in Apocalypto moving smoothly from left-to-right, while the satellites allow rear effects to interject with no more disruption than the film's soundtrack demands. Add an authoritative and clear centre channel and this system starts to seem head and shoulders above the competition. While perhaps our only minor gripe is a slight softness to bass notes, for the vast majority of our movie viewing the sub does exactly what a good sub should: go unnoticed, underpinning powerful dynamics with bass weight and depth. It may not revolutionise or think outside the box in the same way as some other Q Acoustics products, but the 2000 Cinema Pack will give the budget home cinema speaker category a thorough shake up. And that makes it exciting enough in our book.